To create a decent second hifi system I purchased a secondhand Naim NAC 72, intended to be combined with my surplus olive NAC 140 and Hi-cap. After receiving the 72, it was installed in my main Naim system comprising Naim NAC 82, DR Hi-cap and 2xNAP 135 monoblocks. The sound was good, typically Naim with lots off energy and rythm, but maybe a bit harsh. When searching for information about the 72, I noticed a reference to Ryan Soundlab. Their web information is very informative and credible and made me tempted to take the risk of ordering the complete package of boards, including the MC phono boards and the remote controls. Actually, there was no risk with this, since the products can be returned and the money refunded by Ryan Soundlab. After some days the products were delivered in my mailbox and I eagerly mounted them in the 72. That work was very straightforward with the support of the video instruction provided at Ryan Soundlab's website. Then quickly installing the preamp in the main system. Immediately, it was obvious that the sound was very good. The soundstage was much improved, making it easier to localize instruments and voices. Also detailing was improved, perhaps supporetd by the improved soundstage. Another impression is that the sound is warm, smooth and seems a bit more relaxed than before, but still very dynamic. However, the traditional Naim sound, pace , rythm and timing is maintaned or even improved. This may seem a bit contradictory, but that is my impression. To begin with the vinyl sound appeared to be a bit thinner than with the Naim phono boards, at least wit my Lyra Dorian cartridge. However, the detailing was very good and it appeared that the bass was a bit tighter than before. However, with time there was obviously some burning-in going on and the bass became more full. The system has been tested with several loudspeakers, including Naim friendly speakers, such as Neat Motive 2, Royd Sourcerer SE and Royd Albion. Generally for all tested speakers, I have a feeling that the bandwidth has increased at both frequency extremes, but without any sacrifice of midband clarity. Voices are very present. As is obvious above, I am very impressed of this "transformed" Naim NAC 72. In fact it has now replaced the NAC 82 in my main system, which has been disqualified to the second system, i.e. now comprising also the olive Hi-cap and NAP 140. Is the Ryan Soundlab boards a good value? Absolutely! If you own a NAC 72 (assumingly also a NAC 32.5) it is possible to transform them to an extremely musically enjoyable hifi preamp. 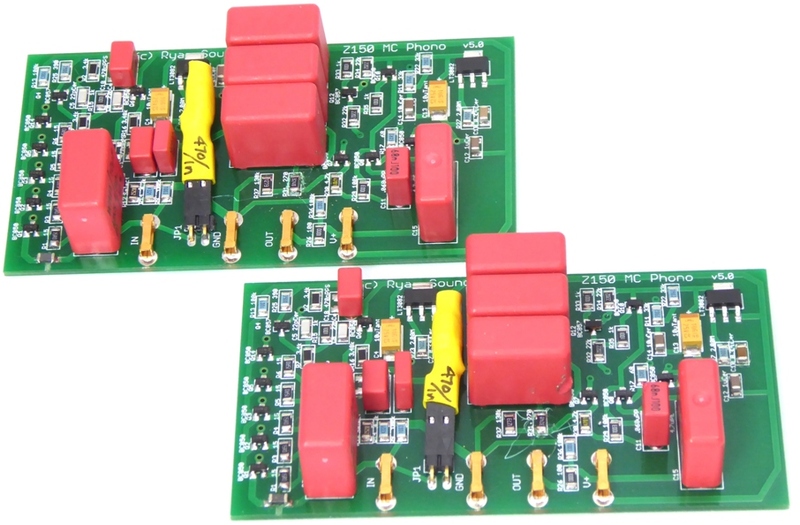 Since 72 and 32.5 preamps are relatively inexpensive, it is a good idea to purchase one and transform them with the Ryan Soundlabs boards to significantly more music enjoyment. The remote controls (yes, two units are supplied) deserve a comment. They of course mean a significant upgrade of the amp, originally designed without a remote. The functions include increasing and decreasing the volume as well as muting. There is also the neat possibility to attenuate the volume, by 10 dB according to Ryan Soundlab. The remotes are small, but seem solid and easy to operate. My wife says they are cute.